For shelving, there's MDF, laminate, oak, hardwood plywoods like birch, specialty boards like ash or maple, and pine. We didn't want to use laminate because all the other built-ins in our house are wood. We couldn't use oak or specialty wood because it would've set us back a ton. Despite them being excellent products for this application, we decided against 3/4 inch plywood or MDF because it would've been a royal pain to cut to size. Menards does not do cuts for customers, so we would've had to bring the 4x8 sheets elsewhere. That was not going to happen, since we don't even own a truck. We ended up with 1x10in 'select' pine boards. They were gorgeous and knot-free! They did cost lots of monies - almost $20 a board for 8ft lengths. But they were already the width we wanted, and the portions we cut off after creating the shelf support frames could be used for shelves. Some people think that pine doesn't make good shelving because it's too soft, but with the proper prep and finish, pine can be just as durable as oak. We created the support frames using 52 inch pieces of the pine boards with a 1/4 inch plywood backing. Hager chose to stagger the plywood backing among the frames, which was not something I wanted. I didn't want to see seams in the plywood on the backs of the bookcases, but he was trying to avoid us needing another piece. So, we will make the best of it with wood filler. Here is the last frame awaiting installation. And it was put in place that evening. The vertical shelf supports line up with the cabinets, for the most part. The two cabinets on the ends are 12 inches wide, while the middle four cabinets are two-door 30 inch wide cabinets. We chose this combination because the wall was 12ft 1.5in long, so 144 inches of cabinets would be almost perfect. We did have to add a filler piece to the right side, as they were a little short. The next steps are priming and putting up the shelf cleats. Lucius approves of the project so far, which is good since I'm sure he will ultimately be sitting up there when it's completed. Can you see it coming together? We are so excited! PS - Hager did not help us just because he is an amazing person. He helped us because we paid him. Just wanted to clear that up for all you (unnecessarily) jealous people! Wow looks so great already!! Love that your cat has already made him/herslef at home on the shevles! I see the vision and I am loving it! Oooh, these are going to be so nice! This is looking so nice! I'm jealous of your future built-in and may be stealing the cabinet/plywood/pine board ideas for our office space. Nice work! This is looking so so good!! Hahaha I like your disclaimer. WE PAID HIM. I am so excited to see this finished product. It's already looking bookcase-esque! I can't wait to see this finished, I know it's going to look amazing! And I'm loving the "WE PAID HIM" disclaimer. Your cat kills me. At least 50% of the pictures I take at my house have my dog's tail or snout in them. They're so helpful. Is this on my to do list? Hell yes it is. You're just making me jealous now. post faster! I want to see IT ALL!!! NOW!!!!! Sara they are coming together - I can already picture how fantastic they will look when they are done! They are going to look super! Wow....what progress! You know have me majorly craving some built-ins. It will look amazing when it all comes together! 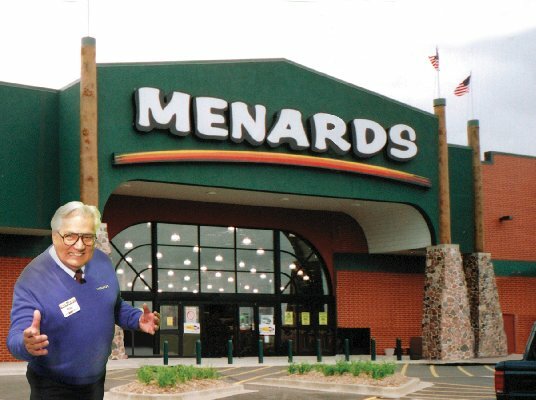 I love the Menards guy! Well I love Menards in general. I spend more time and money there than any other store and when our local one doubled in size I just about fainted. That is going to be amazing!! !